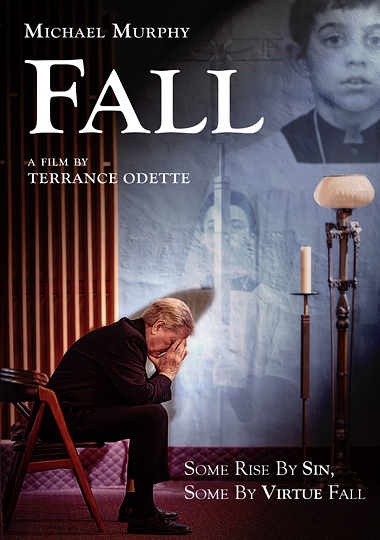 Father Sam Ryan, (Michael Murphy), an aging Roman Catholic Priest living contently at a Niagara Falls parish, receives a letter moving his complacent life into descent. The letter, from ‘Christopher’, confronts him about an incident that happened 40 years ago. Father Sam was a young, charismatic priest, serving a remote, Northern Ontario parish. Christopher was a 14 year-old adolescent, whom Sam mentored. The letter asks Father Sam for the truth: what did take place all those years ago? Were lines blurred or crossed? What choices were made? Forgiveness, redemption and sin are the dominant themes of FALL. All the characters whom Father Sam encounters – through his parish duties and from his suppressed past - guide him into deeper reflection: ‘Chelsea’, a restless bride-to-be; ’Michael’, a repentant addict; ‘Reza’, a gay, Iranian grieving his recently deceased mother; ‘Sheila’, Sam’s free-spirited, benevolent sister; and finally, ‘Catherine’, the shattered wife of enigmatic Christopher. Now haunted by his memories, for the first time in his life Sam is compelled to reconcile himself; more than as a Priest…as a man. Did a sexual encounter happen? Can a moral custodian of the faithful; a dispenser of God's grace, transcend his own FALL? FALL is at once intimate and remote - both revealing and concealing - richly filmed in wide-screen/anamorphic to capture the majestic power of the Niagara Falls of Sam’s present, in contrast to the vast, frozen Northern Ontario communities of Sam’s past. The award-winning, creative team of writer/director Terrance Odette (Heater, Saint Monica, Sleeping Dogs), producer Mehernaz Lentin (Portrait of a Serial Monogamist, Invisible City, Heaven on Earth), director of photography Norayr Kasper (Calendar, Sarabande, Trudeau) and lead actor Michael Murphy (Manhattan, Tanner '88, This is Wonderland) collaborated on this ambitious, artistic and very personal chamber drama.